Senior utility player Dom D’Alessandro swings at a pitch during a baseball game last spring. 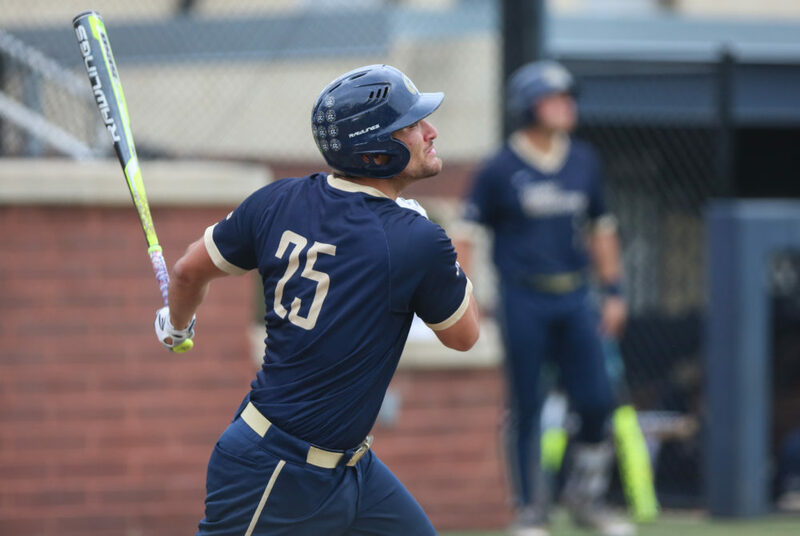 Updated: Feb. 12, 2019 at 1:45 a.m.
Last season baseball garnered the third-most home runs in the conference and relied on its slugging ability to bolster scoring. But this season, head coach Gregg Ritchie said he expects speed and intelligent baserunning to generate runs. The Colonials lack power and consistent hitting from graduated seniors third baseman Isaiah Pasteur, outfielder Mark Osis and second baseman Robbie Metz, creating major holes near the top of the batting order. The trio averaged a combined .319 on the season with a slugging percentage of .506. But with 15 fresh faces on the roster, Ritchie said the Colonials’ speed will help boost what has been lost at the plate from last season as he continues the long task of developing his team into a more powerful offense. “We have enough speed to create things out there and add to whatever offense we have just naturally with the barrels,” Ritchie said. The Colonials boasted one of the top offenses in the Atlantic 10 last season, tying with Saint Louis for the No. 1 spot with a .285 batting average. They led the conference in hits and carried a .356 on-base percentage. At the end of a 32-win season, they became the first No. 7 seed ever to reach the third day of play in the A-10 Championship. But speed is not a new asset for GW. The Colonials stole 104 bases last year, good for second in the conference. Pasteur tallied a team-leading 31 swipes, the program’s second-most stolen bases in a year, while setting a new program record with his 32-game hit streak. But Ritchie said his new roster possesses even more “length and speed” this season and expects more success on the base paths. “We’ve got a lot of speed on this team so we should be swiping bags and getting extra-base hits,” freshman outfielder Cade Fergus said. Ritchie drew a comparison between Fergus and Pasteur because of their speed and quickness around the bases. The team’s top-three returning hitters – senior utility player Dom D’Alessandro, junior utility player Steve Barmakian and junior infielder Nate Fassnacht – hold a collective batting average of .302, while Fergus and freshman infielder Logan Doran are expected to step up in the lineup. “We lost a lot of talent last year with graduation and some of the people going to the draft, but I think this year we brought in guys who are just going to step right up,” D’Alessandro said. Ritchie likened Doran to a “young Bobby Campbell,” the 2017 graduate who hit .355 his senior year. The former infielder – who became a mainstay at first base – held a .307 career batting average. D’Alessandro is expected to repeat his role from last season as a core piece of GW’s offense. The utility player posted a .318 batting average and nine home runs in his junior season, second to only Pasteur. Ritchie cited Barmakian as another key returning veteran for GW. With only 34 strikeouts in 229 at-bats last season, Barmakian was a solid presence on the plate for the Colonials. Ritchie said that while all the pieces are there, the exact structure of the lineup will be determined through trial and error as the season progresses. “There’s going to be some pieces we’re not going to figure out until a little further into the season, like who’s going to hit in what part of the lineup,” Ritchie said. Although the Colonials have been a strong offensive presence in the A-10 for several seasons, they have fallen short of bringing home a championship. Players and coaches alike said this season they have the right combination of talent and dedication to potentially break that final barrier. “The consistency of getting to the playoffs and then going into the playoffs and going a little deeper, going a little deeper, going a little deeper, gives you that confidence, that experience, to where we’ve done this, we’ve been here – now let’s finish it,” Ritchie said. The Colonials open their season in New Orleans against Tulane Friday at 7:30 p.m. The Hatchet incorrectly quoted head coach Greg Ritchie saying “back” when he said “bat.” We regret this error.